I´ve started instagramming! That was another (third to be exact) "I will never" in the crazy world of the internetz. The first one was blogging and the second buying a smart phone with a possibility to use internet wherever I go. I blame the second one for the third and I must admit I´m pretty hooked. But without further ado here´s my instagram account! Then to the mystery. 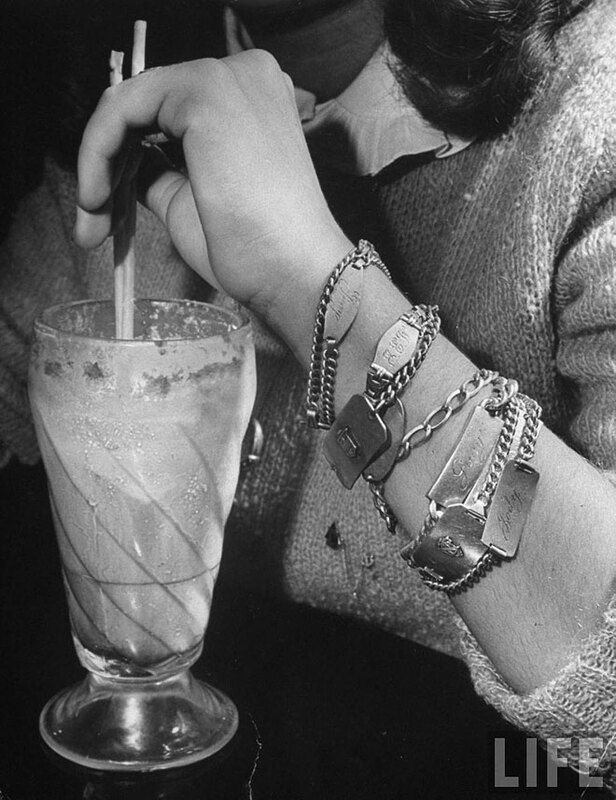 Lately I have come across these pictures of 1940's campus and college girls wearing huge amounts of silver identification bracelets. By the way she is using clear nailpolish to hold her socks up! Can someone tell me more about this popular trend of its day? Were the bracelets given by a friend or a special someone? Nevertheless I love the look!